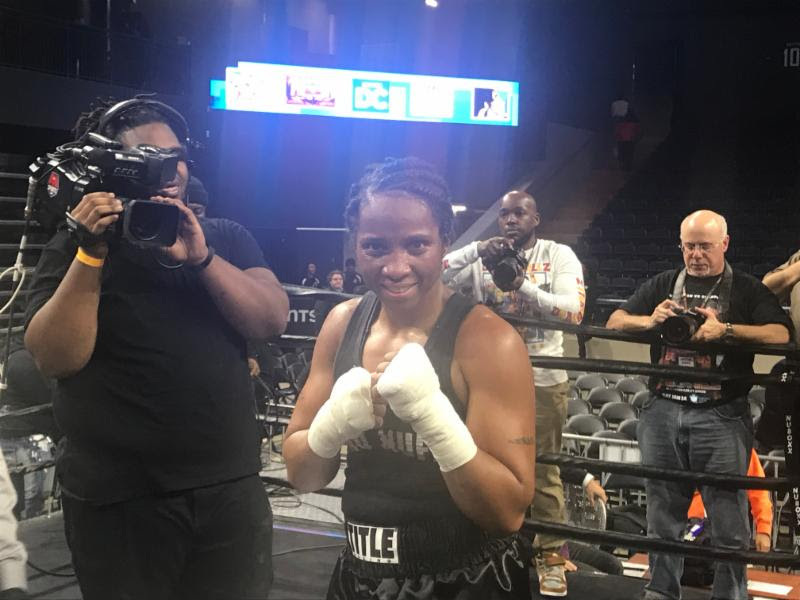 This past Saturday night, Tori Nelson pounded out a 10-round unanimous decision over Sanna Turnunen to retain the UBF Middleweight title in the main event of the first ever fight card at The Entertainment and Sports Arena in Washington, D.C. The eight-bout card was promoted by Tricky Entertainment and DCFightNight. Nelson controlled the action against Turunen by out working her. Turunen was gritty in defeat, but Nelson took the fight in shutout fashion to the tune of 100-90 on all cards. Nelson of Ashburn, Virginia is 19-2-3. Turunen of Finland is 4-2-1. Sam Crossed was fortunate to gain a split decision over Twon Smith in a cruiserweight bout. At the end of round two, Smith dropped Crossed with a hard right hand. Crossed came back to land some solid shots, but was rocked again in round four. The fight was a close fight, but some in the crowd showed their disapproval when the scores were read 57-56 twice for Crossed and 57-56 for Smith. Crossed, 189.6 lbs of Greenbelt, MD is 8-0. Smith, 187.6 lbs of Oklahoma City is 3-2. Kareem Martin won a six-round unanimous decision over Andrew Rodgers in a welterweight bout. Scores were 59-55 on all cards for Martin, 148 lbs of Washington, DC, who is now 11-2. Rodgers, 149 lbs of Elkhart, IN is 4-5-1. Jordan White stopped Ndira Spearman in round one of their scheduled four-round featherweight bout. White landed a body punch that was followed by a left to the shoulder area, and Spearman went down for the count at 2:02. White, 128 lbs of Washington, DC is 7-1 with five knockouts. Spearman, 128.2 lbs of Lavergne, TN is 1-4. In a surprising result, Matt Murphy and undefeated Antonio Magruder battled to an entertaining draw in a welterweight bout. Murphy rocked Magruder several times in round’s two and three, but Magruder came back to salvage the draw with a strong 4th frame. Scores were 39-37 Magruder, and 38-38 twice. Magruder, 147 lbs of Washington, DC is 5-0-1. Murphy 144.8 lbs of St. Louis is 3-30-4. Alexander Johnson won a six-round unanimous decision over Mengistu Zarzar in a light heavyweight bout. Johnson, 177.8 lbs of Washington, D.C. won by scores of 59-55 twice and 58-56 and is now 17-4-1. Zarzar, 182.2 lbs of Palmer Park, MD is 6-6-1. Good looking prospect Kiante Irving stopped George Sheppard in round two of their scheduled four-round super middleweight fight. In round two, Irving dropped Sheppard with a long right hand. Sheppard staggered to his feet, but the fight was called off at 1:06. Irving, 163.4 lbs of Beaver Falls, PA is 3-0 with three knockouts. Sheppard, 163.8 lbs of Virginia is 1-5-1. George Harris remained undefeated by stopping Lamar Lewis in round three of their scheduled four-round heavyweight bout. In round three, Harris dropped Lewis with a hard combination. Harris finished Lewis off by rocking him several more times, and the bout was stopped at 2:00. Harris, 218 lbs of Silver Spring, MD is 2-0 with two knockouts. Lewis, 235.2 lbs of Arkansas is 0-4. Tricky Entertainment has been promoting music, entertainment and lifestyle events in D.C. for the past ten years, and is run by Erwin Pendergrast. DCFightNight is run by Sean Magruder, and this will be his second boxing show in DC. The Matchmaker was Chris Middendorf.